I'd enjoyed my usual Sunday afternoon walk through the Arboretum, and was sitting quietly by Main Marion Way waiting for the time of my next bus home. 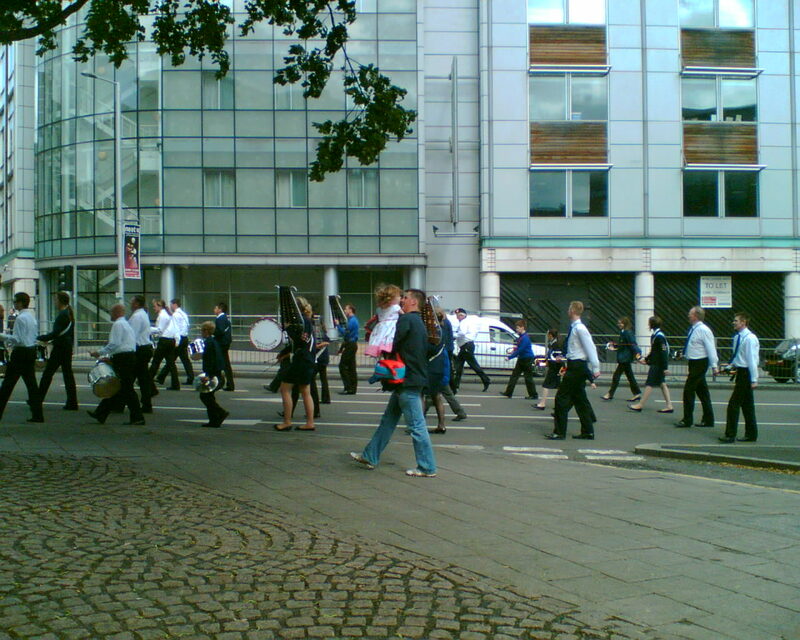 From the bottom of Maid Marion Way came the unmistakable sound of a marching band. Into view it came, headed by policemen and women, who though were there to direct the traffic, seemed to march along themselves to the sound of the beat. The picture shows the beginning of the parade, and I did wonder why more people were not following it. The answer came a few moments later, as the ages of participants got younger and younger, and the size of them got smaller and smaller. The following crowds were obviously family and friends of the youngest members, and there were so many of them for a few minutes that it was difficult to see the parade. I think that the parade was made up of adult and child members of the Boy's Brigade and the Girl's Brigade, as I thought I recognised what banners I could see. The Boy's Brigade was formed sometime around the 1850's, and is very much a uniformed Christian youth organisation . The Boy's Brigade in Northern Ireland is the largest male uniformed Christian youth organisation in the UK. The twirling batons, drums, cymbals, trumpets, and an instrument I can't remember the name of, all contrived to make a familiar and pleasant sound. Near the back of the band were to be found the youngest members blowing on their trumpets, and I must say, surprising as it is for me to acknowledge, it was all very nice in the warm afternoon sunshine. An afternoon of pleasure in Nottingham to be sure. When the band had past, and the sound was disappearing up the Derby Road, I began to think back over the years about my attitude to marching bands and uniformed organisations. I must have been insufferable in my conviction that I was right, and ignored history, culture and the views of others. 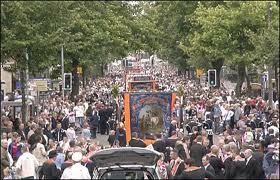 My first taste of marching bands was in 1971, my first full Summer in Belfast, and the Protestant 12th July parades. We made our way to the Lisburn Road, what turned out to be hours before the parade came along so that we could get a good view from the front of the pavement. It was certainly a spectacular event that went on for hours; band after band, seemingly playing the same tune, and the leader of each band vying with each other to see who could throw the baton the highest and catch it on the way down. Some of the marchers had obviously imbibed a bit too much alcohol before the march began, and a little too much more during the march. If I was honest, twenty minutes in to the parade and I was bored stiff. There's only so many bands you can see in one afternoon, and in the next 18 years, I never saw another 12th July parade. I did catch some of the mini-12th July parades in East Belfast, but they were much smaller, and I could escape easily. I was never at ease with the whole notion of the parades really when we were to "Remember 1690". All I wanted to do was forget being shackled by history, and move on, but what did I know, as I was constantly reminded, I was from "across the water". And here I was, enjoying a parade in Nottingham. Who'd have thought it? In the 1970's and 1980's I was firstly connected with, and later became the minister of an evangelical Church in Belfast. Some of the Elders, and a number of the congregation had been members of the Boy's Brigade in their youth. They supported the idea of having something similar in our Church. I was adamant that I would have no uniformed organisation, with all of its military connotations in my Church. How insufferable is that? As if a healthy, wholesome and disciplined programme was going to turn these children and young people into rampant aggressors. But that's how I felt at the time. Now I was gazing upon a uniformed marching band with almost dewy eyes. Who'd have thought it? So thank you to members of the Boy's Brigade and Girl's Brigade for bringing an afternoon of pleasure to Nottingham.